One of the things we love most about our church is the worship. David Moffitt has been our worship pastor for the last 10 years. He and his wife, Susan, are precious to us. They have blessed us tremendously with their worship and their lives. To honor and bless them at their 10 year anniversary our church contacted me about doing a piece of art for them as a gift. YIKES!!! PRESSURE!!!! That’s what would normally be going through my head… but before the church contacted me the Lord had already laid something on my heart to do for them as a gift of appreciation to them – so I already knew exactly (well sort of – at least had a concept in my head) what I was going to do for them. 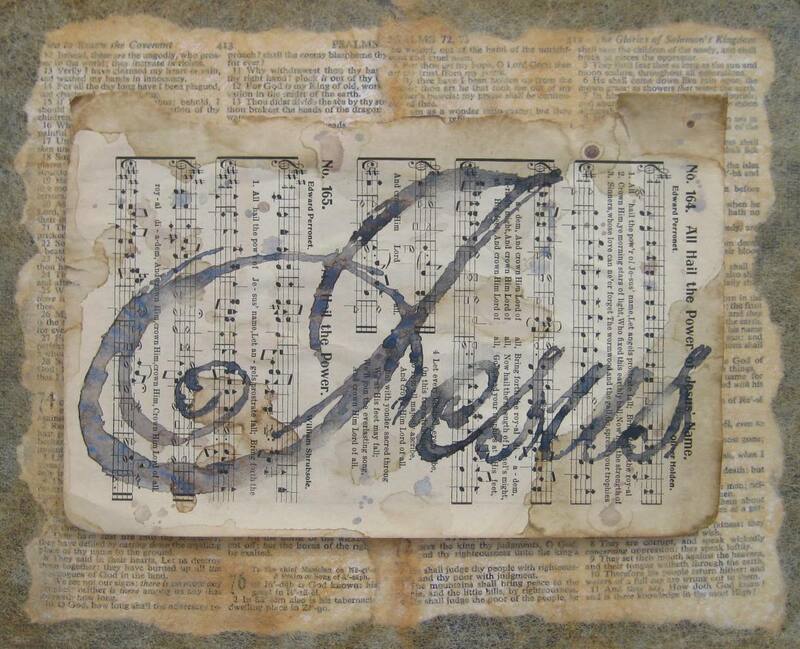 I knew I wanted to do something with an old hymn from some of the old hymn books I’ve collected at antique stores. This one was from a hymn book from 1908. A friend of theirs gave me some suggestions of some hymns that would be special to them and I decided on “All Hail the Power of Jesus Name”. It was a hymn they had in their wedding and I think it speaks of their heart to call all to look to Jesus because He is Lord of all. Susan was at my house a while back and fell in love with some old frames I had, so I used one of those to frame their art in. I knew if nothing else they would like the frame :). 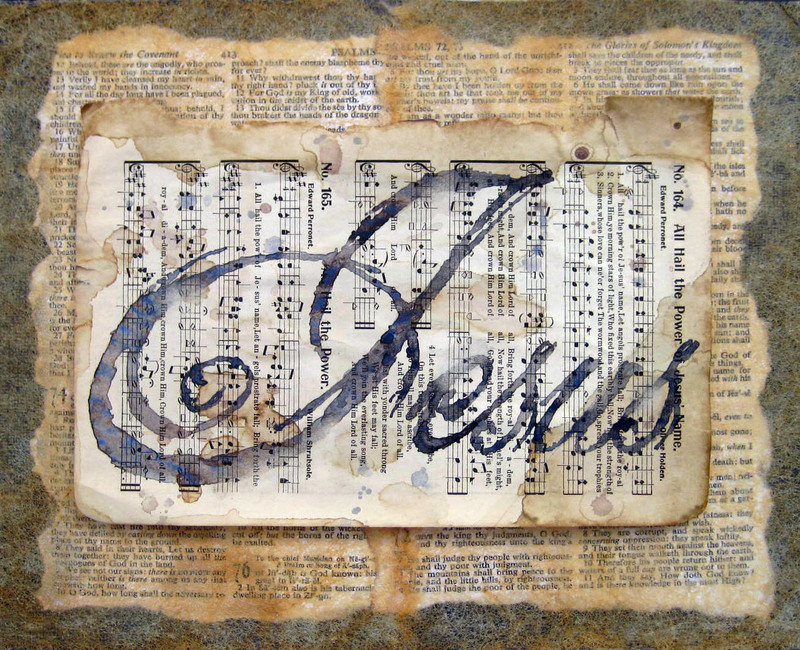 I wanted to do something that highlighted the hymn and something that was simple and beautiful. I had the idea of doing a layered thing – I wanted the hymn to “float” and be the highlight, but I wanted the background to be simple but pretty at the same time. It took me a while to get it the way I liked it, but I picked some pages from the bible (from the Psalms of course since David is a worship pastor) and I did some layering. 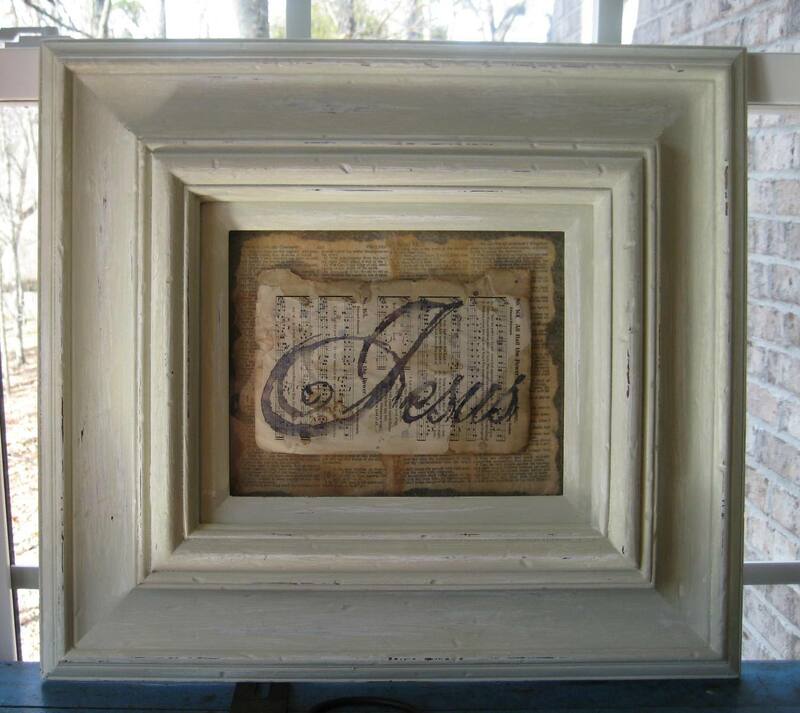 I wanted to soften the background and came up with using… are you ready for this… dryer sheets to layer on top of the bible pages. I dyed the drier sheets in tea to color them and they worked perfectly – it gave the piece the soft look I was going for and some texture. As much as I wanted the hymn to be the focus, I wanted the focus of the hymn (Jesus) to be the main focus. So I painted that as the highlight of the piece. I pray it will be a blessing to them, because they have blessed us and our church tremendously over the last 10+ years. We love you guys!!!!!!! As always, you can click on the picture to see it close-up. How funny….we went to the second service this morning, and when they presented this, I told Jason, “I bet Sandi made that…it looks like her work.”…and I was right! I think it was gorgeous….what a great idea! That is funny Amanda! Good guess! Brother David held it up the wrong way in the first service – it is a little confusing because the name Jesus goes one way and the hymn the other. I looked for yall after the first service but didn’t see you guys. I’m missing my little buddies! I’ll have to schedule a time to see them this week. Thanks for the comment! Beautiful and inspiring. I’m not suprised your friend recognized your work. It’s lovely. Thanks for sharing. Marge, that was actually my sister that recognized it – too funny! Sandy! What a tribute to David and the Jesus he serves!!! You are such a talented lady, and I appreciate that you use it to bless others. Thanks for choosing to bless David and Susan this time. They truly are a wonderful asset of our church community! Trish, amen – they are wonderful asset to our church! Our church wouldn’t be the same without them! Thank you Jason and Julie! this is an amazing gift for a wonderful couple! well done sandy! I looked over to mom in the first service and said “I bet Ms. Sandi made that.” I love you! You are extremely talented! David and Susan’s worship is truly pleasing to the Lord, our Church is beyond blessed with servants of HIM! That’s too funny Amy – my sister did the same thing. Love and miss you! Roger and I were in Alabama last week celebrating his aunt’s 88th birthday so we missed church but several people told me about the gift David & Susan received and I just knew it was something you had made for them and I haven’t seen anyone to ask them about it and now i get to see it and learn how it was made. God is so good to give you this gift so you can share it with precious people like David & Susan. Hope yall had a good trip Barbara! We are in Colorado skiing this week. We’ll hopefully have some good pictures and paintings to share when we get back. Thanks for the kind comment!!! There you go again sweet sister- using your gift from the Lord to bless not only Susan and David, but all of us here in blogworld as well! 🙂 How beautiful Sandi. May the Lord continue to anoint the work of your hands as you bring honor to Him through your work! Blessings ! Thank you Nancy! I pray He continues to bring honor to Himself through this gift too – Amen!!! It’s beautiful Sandi! You really did a great job! Great job Sandi…beautiful! I know that they will treasure that forever. Hope you guys are doing well! Miss you! Thank you Jennifer! We are doing good! I miss seeing you! This work is moving and beautifully done. Hope your classes go well this summer. Teaching is a real blessing when you see others experience creating their own works of art. Someone said that since we are created in His image, and since He is THE creator, it’s obvious that we have been made to create, too. Thank you Sandy and I have to say a big AMEN to the last part of your comment. Thanks for stopping by! Hey Sandi have you ever done any shadow box art work with the beach scene I have a condo that has a piece of artwork that says S.Hester 89′ hanging in the bedroom just curious absoultley beautiful! That’s funny! No, it’s not my art work – I wasn’t even painting in 1989 :)!